TradesMan tracks your person to person trading along with details about that character as well as date and location. Trades are stored for each of your characters that perform trades. 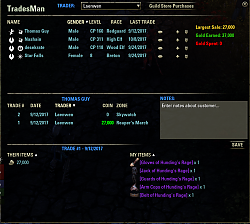 You are able to see a history of all trades along with what items and any gold exchanged during a trade. 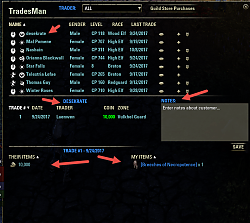 Tradesman also tracks your guild store purchases so you can see how much you paid for a particular item and the quantity you purchased. Gold spent and gold earned is tracked for each toon, so you can see how much you have spent and earned trading. You can also store notes for a customer to reference later, build that customer relationship and become a master tradesman! you can keybind TradesMan, as well as use the slash command below to open the window. 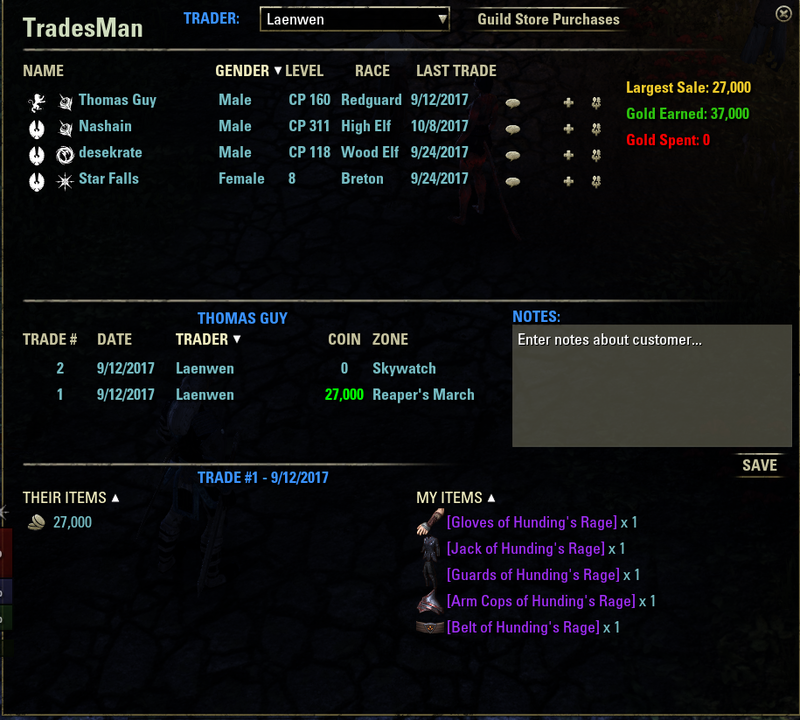 Guild store purchases are tracked and displayed when you click the "Guild Store Purchases" button from the main TradesMan window. In order to get the class, race, and other details about your customer you will need to have your reticle over the customer when the trade completes or this information cannot be stored. Please note: information for trading and guild store purchases is only refreshed after using /reloadui or initial character login. Please feel free to message on my author portal, with any feedback or bugs. Hi QuadroTony, I added some change log notes on the main page, I only fixed some display bugs and an item name bug. 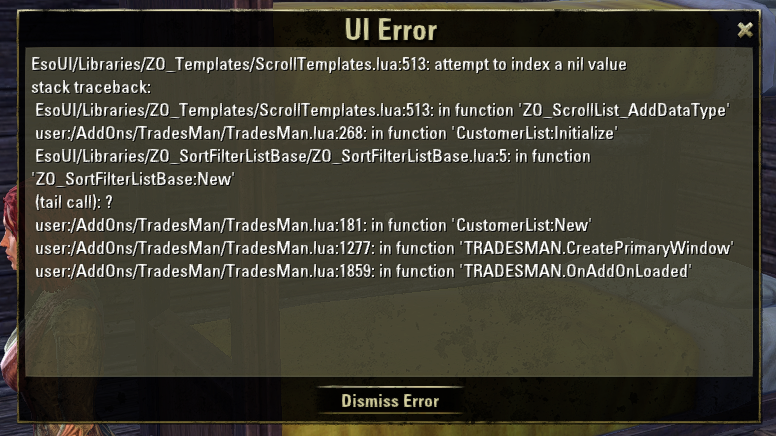 That would be interesting if someone wanted to incorporate a hook for tradesman to send data to master merchant or other addon to include those trades. Last edited by QuadroTony : 09/27/16 at 09:05 AM. Hey There QuadroTony, this has been fixed! Last edited by Argusus : 09/09/15 at 06:01 PM. the error message when you log in for now. Sorry for the inconvenience. thanks man! works great =) will promote it in my trading guilds! Awesome! Glad to hear it :-) I appreciate it! 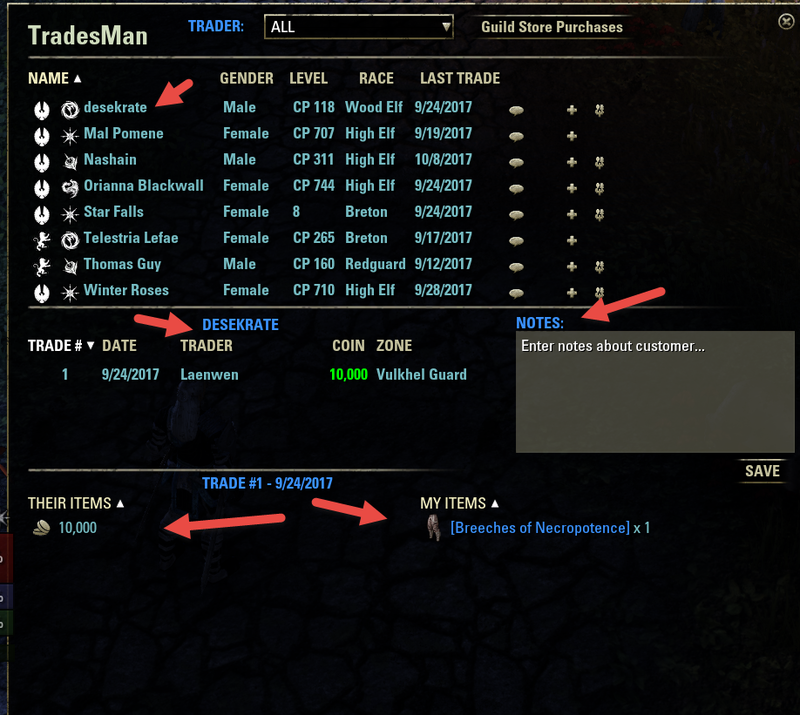 does it tracking my trades from the guildstore? 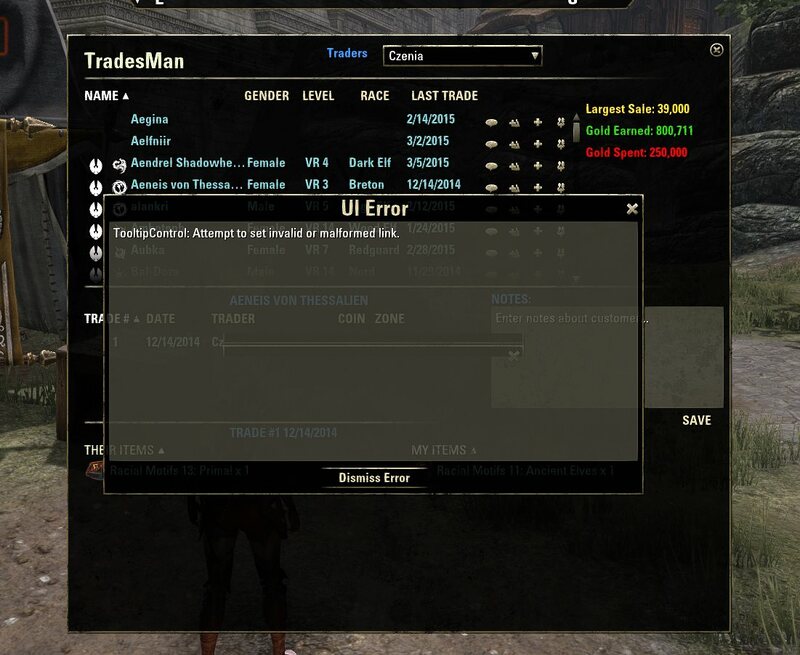 usualy i m buying stuff in the guildstore and reselling it but it doesnt show me any of my trades? this feature to track guild store purchases is now published in the latest version. Hey there Fldji, I'm working on this feature now. I should have an update available in the next few days to show you your guild store purchases, I will add a new button that opens a window with the item details and date and pricing. Hopefully this will help you. it just tracks person to person trades. I have been considering tracking guildstore purchases but don't want to reinvent the wheel. there are great addons for tracking guildstore sales. Should be resolved for you with the update I just posted.